Welcome to my first blog. I want to start by saying that the last thing I want my blog to become is a platform for me to talk about myself. My aim with this blog is to share my passion for furniture, to show you what we are making in the workshop and hopefully share with you some tips about how to make furniture and marquetry “my way”. So what is my way of making furniture? How does it differ from anyone else’s? And this is where I do digress to talking about me. Before I can start describing my methods and beliefs, and how they relate to my style of making and teaching, I feel I should explain more about where I come from and my training. I am French and I was born and raised near Paris. I do not come from a family of cabinetmakers. My father wanted to be a stone carver but was persuaded by his father into a “proper job” and worked for EDF (both the French and English will recognize the initials of the big electricity supplier). He was very technical and practical and collected artisanal antiques. My parents often commissioned the local cabinetmaker to make simple furniture for us and I used to be taken to the furniture maker’s workshop quite regularly. There is no doubt that seeing this cabinetmaker’s/restorer’s work inspired greatly my desire to work with wood. My mother was also a big influence. As a young woman, she was one of Christian Dior’s “petites mains” who made the one-off designs for the catwalk. Her dressmaking and sewing skills were simply amazing and I spent many hours in her studio watching her work. Going with her to choose fabrics and learning how to recognize quality made me fall in love with rich and luxurious materials, not only fabrics, silks and velvets but also precious woods, stones, shagreen and much else. It seems I managed to inherit the technical abilities of my father and the artistic inclinations of my mother. I was determined to be a cabinetmaker from a very early age however my parents, reluctant to see me abandon formal education too early, imposed a condition. There was only one school that offered baccalaureate standard education combined with cabinetmaking instruction and they applied for a place for me. This was the prestigious Ecole Boulle in Paris which, since its origin in 1886, had supplied applied arts workshops all over France with a steady stream of highly-trained craftsmen. Until the beginning of the 1990s, the Ecole Boulle only accepted students who were under 17 and who had come straight from other schools. Places were determined by an entry test and, in my year, there were more than 1500 applications. 500 were allowed to sit the entry examination with only 50 places available. Luckily, I was one of those who passed and, at the age of 15, I became one of the privileged students of the Ecole Boulle. At this time the Ecole Boulle was the only school in France that had a five-year programme with 11 workshops specializing in the teaching of the many arts associated with furniture making. These included not only cabinet making and marquetry, but also lacquerwork, sculpture, upholstery, bronze making not to mention drawing, painting and design. We were privileged, no doubt. The Ecole Boulle was independent of the state education system and was financed by the Mairie de Paris. Money was never an issue and the materials we used as students were beyond belief. Shagreen, ivory, turtleshell, amboyna burr, you name it, I used it at school. MDF was not a word we heard very often. I started at the very end of the 1980s and I consider myself lucky to have been one of the last intakes of students to be trained by master craftsmen. Today educational regulations have required Ecole Boulle’s teachers to possess more formal qualifications and this has made teaching there the preserve of teaching professionals. In my days (I sound old, sorry) students were regarded as apprentices and semi-retired older master craftsmen ran most workshops. However, things had already changed by the time I entered Ecole Boulle. I had an uncle who had enrolled in 1947, and compared to him, I had it easy. My uncle only lasted a year in what was an extremely strict and challenging environment where practically all the students came from families of cabinetmakers. Back in the late 80s, the teaching was based on a 42-hour week divided half and half between academic subjects and the technical/artistic disciplines. Many students came from outside Paris and lived with foster families. Fortunately I lived within commuting distance and would leave the house at 5.45 each morning, returning home at 8pm to start my homework. These long days marked the beginning of a hard and physical career. Yet I have no regrets and I have fond memories of many of my teachers, and two of them in particular. I have deep respect for my cabinet-making master, the late Monsieur Sanche (Gerard Sanche), who, with his stern face, high standards and strict discipline, terrorized us from the first moment we walked into his workshop. He was always well groomed and dressed in an impeccable white “blouse”, with a formal tie underneath. The students, in contrast, were required to wear blue coats and to have short hair (I never knew if this was for security reasons or for pure old fashioned discipline!). We were absolutely banned from putting our hands in our pockets and those students who transgressed were forced to stitch closed their pockets. Each day the teacher went round the workshop checking our hands and nails for cleanliness while we stood to attention behind our benches (and to this day I’m afraid I will not tolerate dirty hands in the workshop when working with light coloured woods). I remember how the whole of the first term was spent sharpening hand tools and planing the same plank of wood to Mr Sanche’s exacting requirements. Mr Sanche inspected our tools every week. His method was to pull up his sleeve and try to shave the hair from his arm with our tools. Failure to keep blades razor sharp was costly: any blunt tool was hammered hard on a piece of steel and the students spent their breaks back at the grinding wheel and sharpening stone. Needless to say the dropout rate amongst the students was considerable; not to mention the many who decided to transfer to one of the less demanding specialisms. In the second term, once I had achieved perfect planing, my beautiful piece of squared beech was, to my aghast disbelief, used for hand sawing exercises. But despite all the hard work we respected Mr Sanche, not just because of his formidable presence in the workshop, but because his knowledge was impressive. Mr Sanche was a third generation cabinetmaker. He had himself received a strong training at the bench and had gone on to develop his father’s furniture and restoration business into a high-end decoration and furniture-making company. By the time I went to Ecole Boulle, his business had slowed down so he could prioritize his teaching. Despite having abandoned the bench many years previously, Mr Sanche could, at any moment, take up a tool and demonstrate to us perfect work. And this applied to all the teachers in the school; they were not only able to talk but could always demonstrate to perfection. After the first year of learning about hand tools and joints, the second year focused on the making of an “easy” Neoclassical table. This classic design had straight tapered legs with a parquetry decoration and an oak drawer, assembled with handmade dovetails and finished with gilt bronzes. The bulk of our time was spent in the hand workshop, but lessons at the machine workshop ran in parallel. What we did by hand at the beginning of the week, we made using machinery at the end, to show us the differences, advantages and disadvantages of one approach or the other. To this day, I still prefer handwork but I do recognize the advantage of machinery being faster and easier when preparing timber. 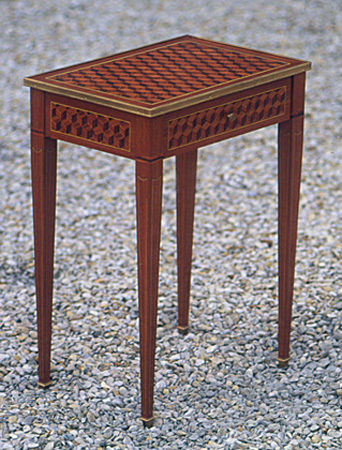 Neoclassical table in mahogany with a parquetry inlay, made by Yannick Chastang in 1990. This was the standard second year cabinetmaking project at Ecole Boulle. Most of us were 16 years old when we made this table. It was done entirely by hand, using hide glue. The third year saw students making a considerably more complicated Louis XV table, with marquetry decoration and veneer on all surfaces. This exercise introduced us to working with curves, including gluing the veneer on the curved legs using animal glue, use of the veneer hammer and sand bags. Vacuum clamping was just starting at the time so our education included the, now thankfully redundant, use of hot aluminum plates. At the time, veneer was clamped with hot aluminum plates that would liquefy the hide glue. The aluminum plates were heated in an oven to a certain temperature. Testing for the correct temperature was empirical but accurate. Students were taught to drop water on the plate; if the water bubbled then the temperature was right, if the water bounced away from the plate, it was too hot. I leave you to imagine where the water came from – there wasn’t a tap on hand. I have fun memories of shouting to clear my way across the workshop while running with my hot plate to the veneer press at the other end of the room. It wasn’t the best workshop layout but any deficiencies of arrangement proved greatly inspiring when it came to arranging my own workshop twenty years later. Making this Rococo style table was the project for third year cabinetmaking students at Ecole Boulle. Again it was entirely hand-made but was a much more complicated design with complex shaping and veneering. The fourth year directed us to explore modern furniture and, while learning the basics of design in our art and technical lessons, our practical lessons focused on making a modern piece from someone else’s design and specifications. This provided great preparation for working with decorators and clients today. I do not find it difficult to make a real piece of furniture from a tiny sketch on the back of a cigarette packet (as provided to me by the artist Louis Cane). Many of my pieces have originated from a drawing on the back of an envelope. Our final year was spent on the design and making of our own piece. We were given the subject of the sea to work with and I based my design around 1930s yachting. Graduation day was extremely stressful, standing next to my piece while notable cabinetmakers examined every edge and surface before deciding on my mark. I’m pleased to say my graduation piece was well received and was subsequently taken to exhibitions around the world, including the Beirut Salon des architects in 1995, to showcase the achievements of the school. So five years later, at the age of 20, I was a graduate of the Ecole Boulle. However I didn’t feel I had yet explored all that the school could offer me and I had a great desire to do a marquetry course. At the time the school did not offer any “further education” but with the marquetry teacher, Monsieur Ramond’s, support and juggling of some typically French bureaucracy, I was allowed to spend a further year in the Marquetry workshop. Having already graduated from the school, my year with Pierre Ramond was exclusively practical and I spent all of my week learning marquetry in an intensive and highly productive individual programme. Over that year, Pierre and I developed a strong working relationship that, once I left the school, turned into a friendship that I value to this day. Pierre Ramond usually needs no introduction: he is a guru of marquetry. The main difference between Pierre and the other teachers was, not only his passion, but the fact that he was the author of the best selling book on marquetry. His academic and historical knowledge was greatly respected, not only at the Ecole Boulle, but also at the University Sorbonne where he was teaching at the same time. Like all teachers at Ecole Boulle, Pierre was a great craftsman with a solid technical background. He started working in the field at a very young age, subsequently heading up the marquetry workshop for the famous Roseneau workshop, and then opening his own workshop with his wife Gigi near Paris. 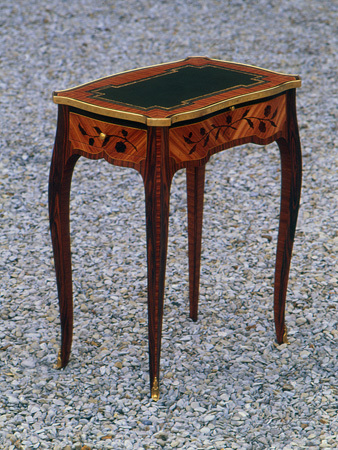 In the 1970s, marquetry was not taught as a primary subject at Ecole Boulle however once Pierre was invited to join the staff he quickly developed a workshop with a worldwide reputation. Most of his students liked him. While just as formal and exacting as Mr Sanche, he was warmer in nature and more approachable and the marquetry workshop was the most desired workshop amongst the students. Pierre was very choosy and he would never take on a student who did not have a cabinet making training first. My five years with Mr Sanche had proved a strong recommendation to Pierre. In later days, he was forced to become more accommodating and less demanding when the school decided to take on fee-paying American students. His fame and academic renown made him a very marketable commodity and the school sensibly capitalised on the expertise they had at hand. However, amongst the younger, poorer students discipline and hard work was strongly enforced. The teaching was traditional and we learned making marquetry the old way. Making our piercing saw blades by hand was mandatory. These blades were made from watch springs, into which teeth were filed, set and sharpened, all by hand, then tempered. Making the blades as quickly as possible became competitive amongst the students. Our first blades would take us over an hour but, as we got better, time could be got as low as 8 minutes. However the quality had to remain excellent. Pierre would raise the blade up to the light to check the setting of the teeth and every Boulle student will remember his blunt “pas bon” if the blade was not up to scratch. The blade was then broken in two and we were left holding the pieces with no option but to start again. At that moment, I am sure that many of us would have cheerfully killed him! The marquetry work had to be of the same high quality. Working as precisely as to tenths of millimetres, the marquetry, all cut by hand on traditional Parisian marquetry donkeys, had to be perfect. Pierre would never judge a marquetry that had just been assembled on the backing paper. Water from the glue often made the joints very tight and therefore deceptively perfect. The marquetry pieces would stay on his desk for few days to dry before he even looked at them. Then the marquetry exercises were scored, one of his methods being to hold them up to strong light and, if any light came through, the score and comments were once again not very tactful. If he were really unimpressed then the marquetry work would end up in pieces beneath the bandsaw. 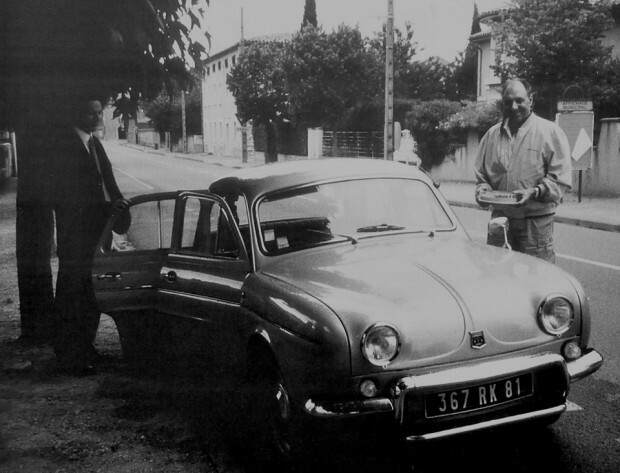 Pierre Ramond and Yannick Chastang with Ramond’s perfectly maintained 1964 Renault Dauphine. This photo was taken in 2001, after a long day of lecturing to marquetry enthusiasts, in Ramond’s hometown of Soreze in the south of France. Pierre Ramond undoubtedly fostered and encouraged my love for antique furniture. Thanks to Pierre, I secured a one-month internship at the Wallace Collection (which turned into employment two years later) and he recommended me to the Musée des Arts Decoratifs for a 2-year placement as a junior restorer. He also introduced me to the great furniture restorer Michel Jamet with whom I interned on a part time basis and during school holidays. These experiences form different chapters of my life and training but I know that many of the doors that opened to me were thanks to the solid, traditional and high-quality teaching of the Ecole Boulle, and the encouragement of extremely knowledgeable, devoted teachers. To this day, I am grateful to them and to all the people who have helped me on the way and I hope that what I do now, my making, my restoring and my teaching, are all a continuity of their knowledge and passion.